Apart from providing reviews, buying guides and all other information about trekking equipment, gears and accessories, we have also started conducting trekking expeditions to some of the most popular locations in India. We have our own team of professional trek guides, leaders, porters and other support staffs to conduct these tours. We also provide the best quality trekking equipments which come as a part of the package. If you are fond of trekking or want to experience the ambience of the great Himalayan range for the first time, just take a look at some of the treks that we are conducting right now and get in touch with us to get answers to all your queries. NJP Station or Bagdogra Airport to Kopidana. 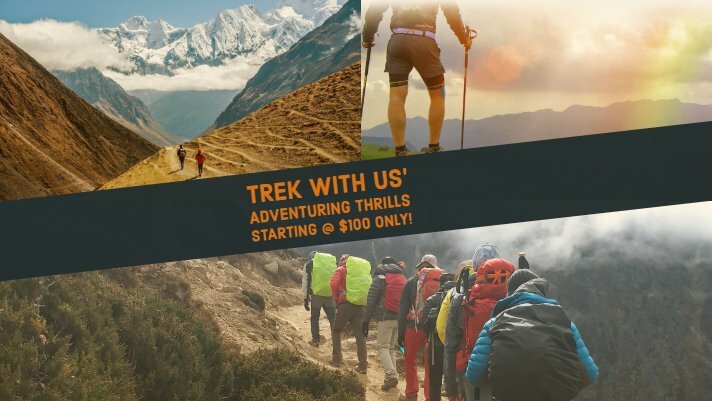 Enjoy the breathtaking beauty of Sikkim with the Goecha La trek that will take to through the dense Himalayan forests and meandering rivers with snow-capped peaks in the horizon. Situated at a height of 15,100 feet, Goecha La provides a spectacular view of the Kanchenjunga with the Goecha La Lake just beyond it. The route to Goecha La will take you through the heart of the snow-covered Himalayas and also provides an excellent view of as many as sixteen peaks which is visible from Dzongri top. Main USP: Goecha La provides a view of the fascinating and spectacular peaks of the Himalayas which includes the Kanchenjunga. Apart from that, the trek begins from the town of Yuksom which is an ancient town of Sikkim with a lot of things to discover for you. Goecha La is also home to a rich variety of flora and fauna that will leave you mesmerized for sure. New Jalpaiguri (NJP) to Yuksom Town. Tsokha to Dzongri via Phedang. Dzongari to Thansing through Kokcharang. Lamuney to Goechala through Samiti Lake and back to Lamuney. Har Ki Doon is situated at the western flank of the Garhwal mountain range in the Uttarkashi district of Uttarakhand. A walk to the Har Ki Doon valley will provide a fascinating view of the Jaundhar glacier and the Swargarohini group of peaks. The area is a major source of the Yamuna river system and is also the main source of water for the largest tributary of the Yamuna. The route will take you through alpine forests with pine trees and a variety of fauna that will serve as a treat for the eyes. Main USP: Har Ki Doon provides a clear view of Swargarohini – I, II, III, Bandarpoonch, and Blackpeak. Apart from that, the forest is covered with a rich variety of flora and fauna with its own beauty. Another major attraction is the temple of Osla which is dedicated to Duryodhana and built by the inhabitants of Saur. Sankri to Pauni Garaat via Taluka. Kalkattiyadhar to Har Ki Doon. Har Ki Doon to Pauni Garaat covering Osla Temple. Pauni Garaat to Sankri via Taluka. With a thin line of coniferous pine trees and falling snow, Kedarkantha trek is one of the most popular trekking expeditions in India. With falling snow in the winter, it provides a spectacular view of the snow-covered Himalayas from the highest point. The total trek covers a distance of only 20 km which means first-timers can easily go on this trek to experience the beauty of the mountains for the first time. Main USP: The dense pine forest, lush green meadows and cascading streams provide a unique and one of a kind experience to the travelers. The journey can be even more eventful if it is undertaken in the winter as you can see snow-capped trekking trails and buckets of snow at the base of the pine trees. Kedarkantha base to Kedarkantha peak and then descend to Hargaon camp. Hampta Pass trek is one of the easiest and most convenient of all the treks available in the state of Himachal Pradesh. It provides scenic landscapes, green pastures, glacial valleys and the thrilling crossing of the pass itself that will surely make you awestruck. The total trek duration is of four days but an extra day is usually added to cover Chandrataal which is a high altitude alpine lake. Main USP: The high altitude lake called Chandrataal is spectacular to watch. Apart from that, the trek route goes through the Hampta Pass itself which will provide a very exciting and thrilling experience for sure. Manali To Chika covering Jobra. Balu ka Ghera to Hampta Pass Crossing. Chatru to Manali via Rohtang Pass. Tarsar Marsar is a popular trek in Kashmir, which is also known as “Switzerland of India”. The trek is about exploring two lakes in the region called Tarsar and Marsar. The lakes sit at an altitude of 12,500 feet and trekking along the borders with clear blue skies above will surely provide an experience of a lifetime. This trek also serves as an alternative to the Kashmir Great Lakes Trek. Main USP: Walking through the pristine valley of Kashmir, with lush green meadows, velvet grasslands and hovering pine trees will provide an amazing experience if you are a first timer in this region. The route also passes through the Dachigam National Park that is home to a variety of exotic birds and animals like Himalayan Black Bear, Long-tailed Marmot, Kashmir Stag, Leopard cat and more. Aru Base camp to Lidderwat. Sundarsar to Marsar Lake and then descent to Homwas. Located in the beautiful town of Ladakh in the Jammu & Kashmir state of India, Stok Kangri is one of the most popular treks in the region. The trek embraces deserted surroundings and will allow you to experience complete peace. The journey also takes you through many ridges and hence you will get to see sudden changes in the scenery of the surroundings. Main USP: Stok Kangri provides a clear view of the Karakoram Range in the north and the Zanskar range in the south. Apart from that, the vast open land in front of the Stok Kangri peak also provides a spectacular view of the Himalayas which is the highest mountain range in the world. The whole day at Leh for acclimatization. Leh to Chang Ma through Stok Village. Mankorma to Stok Kangri Base Camp. Rest Day at Base Camp for Training. Base Camp to Stok Kangri Peak and back to Base Camp. Base Camp to Stok Village, then drive to Leh. Bhrigu Lake is a mountain lake located in the upper Kullu Valley on the eastern side of the famous Rohtang Pass in Himachal Pradesh. A trek to Bhrigu Lake will provide a fascinating view of the snow-capped peaks of the Himalayas, lush green meadows and thick forests. The Bhrigu Lake Trek has gained significant importance in the last couple of years because it is quite an easy trek and does not require prior experience or training of any kind. Main USP: It provides an unparallel and fascinating view of the Seven Sister Peaks along with the Pir Panjal ranges. The rich line of oak and cedar forests with green meadows, meandering streams and velvet flooring with alpine vegetation will provide a captivating experience. Drive to Gulaba from Manali and then trek to Gulaba Meadows Camp. Gulaba Meadows Camp to Rola Kholi. Rola Kholi to Bhrigu Lake and then back to Rola Kholi. Located at the heart of Kashmir, the trek provides a serene view of the Great Lakes along with the barren snow clad mountains. It covers a total distance of 63 kms and is completed in 7-9 days. However, the trek requires you to be fit and healthy as the final ascent to the Great Lakes is a steep one and requires a lot of stamina. Main USP: The trek provides a clear view of the villages of Kashmir from the top, especially the Sonamarg village. In addition, it also provides a complete array of terrains like lush green meadows, snow-clad glaciers, rocky land, passes, meandering streams and so on. Sonamarg Village to Nichnai through Shekdur. Nichnai to Vishansar Lake crossing Nachnai Pass. Roopkund is a famous glacial lake located in the state of Uttarakhand in India. It sits at an altitude of 4,800 meters in the Garhwal range of the Himalayas. This lake is famous for the huge number of human skeletons that can be found near its banks. It is believed that these skeletons belong to the 12th century to the 15th century. The close proximity of the Roopkund Lake from popular hill stations like Nainital and Kathgodam attracts thousands of people every year. Main USP: The presence of a few hundred human skeletons on the banks that belong to the Palaeolithic age attracts thousands of visitors from both India and abroad every year. It is believed that the death of so many people in this area was because of landslides, blizzard or an epidemic. Didna Village to Ali Bugyal. Bhagwabasa to Roopkund Lake and then back to Patar Nachauni.